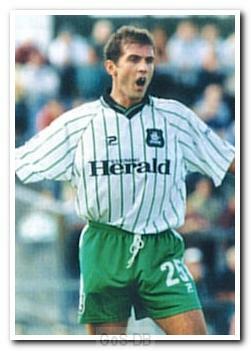 Mardon was a former Welsh international defender who spent a month on loan to Argyle from West Bromwich Albion. Having started his career with Bristol City, with a brief loan spell at Doncaster Rovers, he played for Birmingham City for three seasons before joining West Brom. He made over 150 appearances over 8 seasons for the club, and in addition to his time at Home Park went on loan to Oldham Athletic and Wrexham, before retiring in 2001 due to injury.